Taste test: The only time we attended a Hawaiian luau, we were pretty disgusted by the smell when they unwrapped the giant pig they were roasting in the ground, so we were hoping that these chips didn't taste like that smell. Luckily, they didn't. 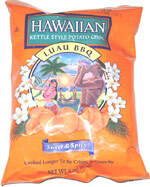 These chips were kettle-cooked with a lot of the orange powder that you would find on a typical barbecue chip. These did have a unique taste: When you first bite in there's a very sweet barbecue taste, but after a few seconds, it changes to a really hot and spicy kick that will make you reach for a beverage. It was really quite amazing on the time delay from the sweet taste to the hot taste. 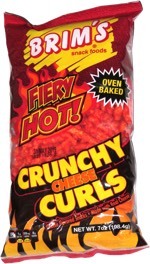 With most hot chips the kick comes quickly. Bravo to Tim's for figuring out a way to delay the spice kick. These would be good for playing a practical joke on someone who doesn't like hot chips. Smell test: Smells like ordinary barbecue aroma. This snack was discovered by Keith at Hyatt Regency gift shop, Bellevue, Washington. Review published .